This is huge not only at the beginning of the year but also throughout the school year. Attending “meet the teacher” nights and open houses is a great first step to get a feel for how the year might go. Most likely, the classroom teacher has already received your child’s IEP or 504 plan if your child has one in place. 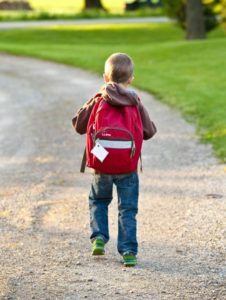 Give your child a chance to settle in for a week or two and for the teacher to get to know your child personally, get some feedback from your child, and then compose an e-mail or a letter introducing yourself, your child’s academic/behavioral/medical history, and any other information you feel needs to be shared with the teacher. Keep it cordial and succinct. Ask about how the teacher would prefer to be contacted throughout the year. As the year progresses, make a point of sending positive notes thanking the staff for the positive things you are seeing with your child’s growth. This helps when you might need to send correspondence about problems or concerns. Teachers are going to be more receptive to working with you if they see that you are noticing both the positives along with areas of need. Recognize and plan for the fact that your child will most likely need extra support at home. This might take the shape of homework support or even just planning for a sensory break at the right time to help your child succeed. Each child is different and each year will be different. New concepts and skills come along, and children are faced with more complex learning and tasks as they progress through the grade levels. Know what your child needs from you at home and plan ahead to meet those needs as best as you can. If you have other children at home, perhaps ask a neighbor to play with them while you work with your child who might be struggling. Keep meals healthy but simple to help you find that time to be one-on-one with your child. And be sure to set bedtimes so that your child is getting adequate sleep. Healthy eating and sleeping can pay off hugely in your child’s performance at school. One of the hardest things for parents is to make choices that affect their children. The unknown ramifications of a choice can often be nerve-wracking. 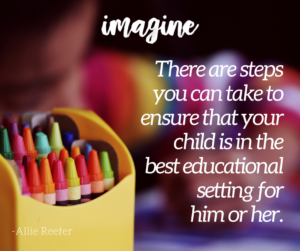 However, if school is not going well for your child and ongoing communication with and support from the teachers has not changed your child’s success in school, then you may be faced with making a choice or two to change the academic landscape for your child. This could be anything from requesting additional meetings with the team at your child’s current school to adjust the support plan, changing schools, choosing to homeschooling, or streamlining after-school activities. Sometimes the choice might even be to simply ride it out and get through as gracefully as you and your child can. This is ultimately up to you. You may be anxious about how those choices will affect your child and your family, but as a parent, you most often know in your gut when things are not going as well as they should, and this may be a point where a different path needs to be attempted. Know that one choice often spills into another, and new opportunities will often arise. Changing directions does not always mean closing the door permanently to the previous paths you and your child have been on educationally. If a new choice is not working as well as you would like, then it’s time to check out other potential choices. Ultimately, your child is God’s child, and He has a love and a plan for him or her. We can only do so much as parents to support and guide our children. Sometimes our choice needs to be to let go and let God. We need to consistently and fervently pray for our children, their teachers and those who work with them, and ourselves as we do our best to support and nurture them. We need to pray for discernment in those tough moments when choices and changes need to be made. When children struggle, the natural inclination of parents is to try to fix the problem. We analyze the issue from every possible angle and try to think of alternatives and what we can do differently. In this, we can often lose sight of the fact that we as parents are human and we can’t fix everything. Faith and prayer and Biblical perspective can ease your worries as you help your child follow the path God has for him or her.